While teaching my two year old son, Avi, to share his toys, I was surprised to find that being generous doesn't come naturally. Generosity, the capacity for giving unreservedly and without expectation of reward, is one of the defining qualities of Judaism. One of the challenges in creating a Jewish home for my family is making abstract ideas concrete in our rituals and practice. As a Jewish mother, it is my privilege to teach my son the skills he will need to help his generation continue the work of healing the world. 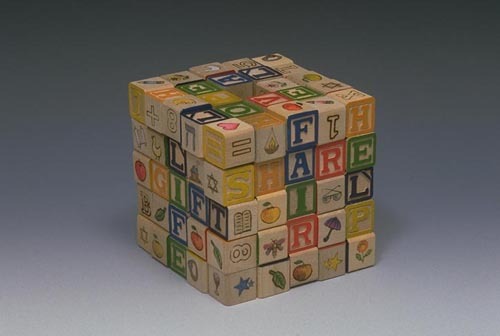 This tzedakah box of children's wooden blocks is about building the foundation for giving and sharing abundance.